Cheryl Aguiar has a strong connection with wildlife and a great love for exploring nature. This is the story of how she gains the trust of one of Mother Nature’s most magnificent and mysterious creatures…the Great Horned Owl. These majestic birds known as raptors have a reputation of being extremely aggressive, but show a different side when struck by tragedy. With some help from her husband, Cheryl’s devotion and determination to help this family of owls turns out to be one of the most gratifying decisions she has ever made. The strong-willed adult owl parents accept help from humans to keep their family safely together. Cheryl gives us an unprecedented look into the life of these wild birds while she closely documents the journey of these two adorable owlets as they grow and experience life in the wild. Through this experience, she witnesses the struggles of survival, the amazing bond of a family and the gift of gratitude. What makes this story special is to see how animals and humans from two different walks of life can co-exist and discover that we are not so different after all. 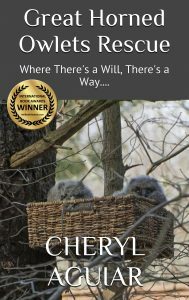 By trusting each other, working together and showing each other respect, the family of owls allowed Cheryl into their world; now, they have become a part of hers. Together, Cheryl, her family and these magnificent birds have proven ever more, the statement…Where There’s a Will, There’s a Way. I have loved wildlife since I was a child. I always knew how amazing Mother Nature and all of her fascinating creatures were, but the experience I shared with this owl family opened my eyes to the true potential and what they are actually capable of and what they will do for their families. I was inspired by the strength and will of this family and the trust they instilled in me. I needed to find a way to reach all of the wildlife and nature lovers all of the world. What a better way than a great book.